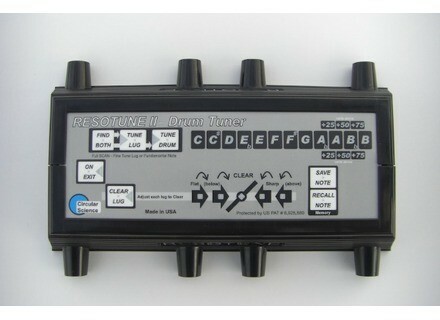 Resotune II, Other Drum/Percussion Accessory from Circular Science. Circular Science's Resotune II is now shipping. 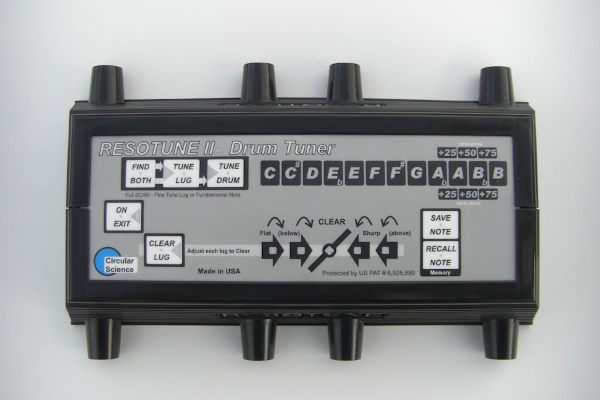 Resotune II is an electronic drum tuner that measures clear quality (lug match) independent of note pitch. This is in addition to displaying the two lowest note resonances (fundamental and lug note). Restune is designed to help you measure and voice your kit for specific note pitches with optimal lug clear quality (lug matching), a measurement that is independent of the note pitch. Resotune II takes advantage of the latest microprocessor technology to read the drum with higher resolution and also uses a new class D power IC to drive the internal speakers more efficiently for longer battery life, the company says. Measures the quality of each lug. Note display shows both Fundamental note (in red) and Lug note (in green), for more information to use when voicing your kit or establishing note spreads. Over Five Octave tuning Range, with 1/4 note steps, for note tuning. Soundiron Tuned Artillery Soundiron has released Tuned Artillery, a new metallic tuned percussion library for Kontakt. ddrum Vintone US ddrum Vintone US is a "made to order" line of steam bent solid shells in Maple, Walnut, Cherry, Oak, Catalpa, Paduak and more.